After taking my time deciding upon a project for the summer, I’ve started to revisit the blog entries I wrote from 2003 until 2006: that is, the years I lived full-time in Keene, New Hampshire, before I met J and moved to Massachusetts. When I first started blogging in December of 2003, my then-husband and I had lived in Keene for a couple months, and blogging was one of the ways I made myself at home in a town that was new to me. Taking pictures and writing about my daily dog-walks helped me find my way both literally and figuratively. When my then-husband and I separated and then divorced in 2004, blogging helped me navigate the alien landscape of my solitary life in a town some 700 miles from my family. During a particularly tenuous time, writing about my life helped me make sense of my life. It’s been more than ten years since my first husband and I divorced, so revisiting the posts I wrote both before and after that event is a strange experience. Some aspects of my life in Keene are still crystal clear, but others have grown foggy with time. 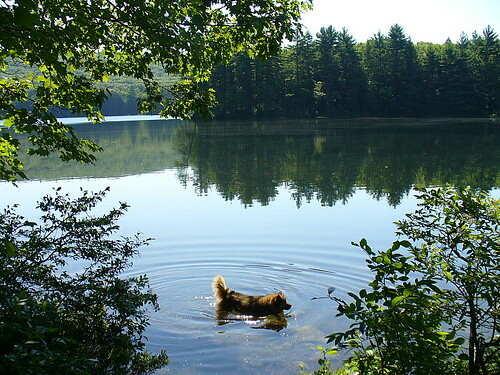 I vividly remember the dog-walks I took with Reggie along the Ashuelot River and around Goose Pond, for instance, but it seems like a lifetime ago that I lived alone in an apartment within walking distance of Keene State College. Revisiting the posts I wrote then is like bumping into an old friend on the street: here is a person I was intimately acquainted with, but we’ve lost touch. 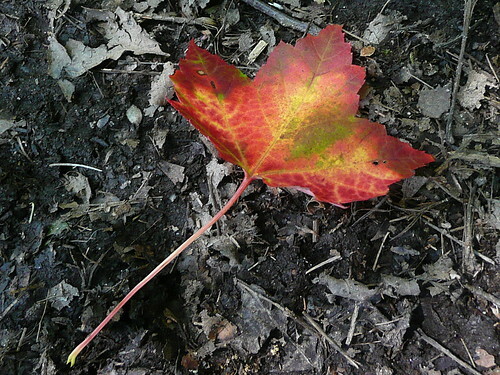 Ultimately, I’d like to collate these several years’ worth of posts into a single year, just as Henry David Thoreau combined the two years he lived at Walden Pond into the single seasonal cycle recounted in Walden. Just as I love May Sarton’s Journal of a Solitude for its clear-eyed account of her life as a writer in Nelson, New Hampshire, I’d like to distill my own experience in Keene into its barest, most essential truths. I moved to Keene as one half of a couple, but I ultimately lived there longer as a single woman than I had as a wife. 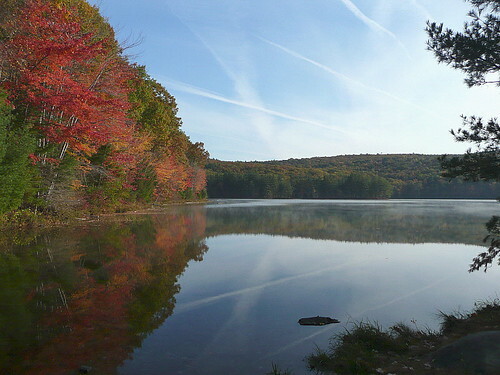 How is it, I wonder, that solitary souls like Thoreau, Sarton, and myself found our way in our respective hometowns? As I work on this project, I find myself wondering how people who don’t write–people who don’t have the memory aid of a journal or blog–go about processing their pasts. I don’t have a particularly strong memory, so I rely heavily upon my journal, blog, and photo archives to remind me of where I was and what I was doing last month, last year, or last decade: without this record, I think my life would quickly fade into fog. It’s a psychological truism that we should learn from our mistakes, but to do this, we need to remember and revisit our past actions. If something as life-changing as my own divorce has already started to fade from memory, how can I internalize its lessons? Or do fading memories indicate an experience that has been gradually digested down to the dregs? 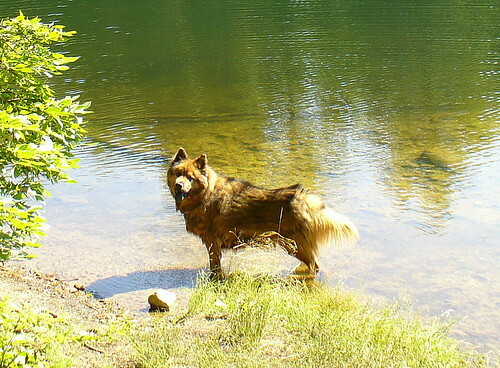 I shot the photos illustrating today’s post on a hot day in July, 2005, when Reggie and I went walking at Keene’s Ashuelot River Park. 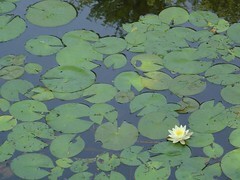 When I saw yesterday’s Photo Friday theme, Surfaces, I immediately thought of water. 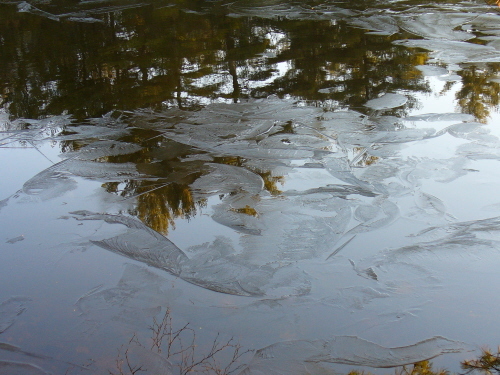 On Thursday night in my “Rivers & Literary Imagination” class, we discussed the way water works metaphorically in Henry David Thoreau’s A Week on the Concord & Merrimack Rivers. Thoreau is fascinated with the tension between a river’s surface and its depths, and he is obsessed with the way water is both transparent and reflective. 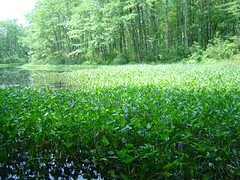 In all his works, Thoreau shows a penchant for puns, and A Week is no different: when Thoreau uses words such as “reflection” and “depth,” he implies these words’ figurative as well as literal meanings, and he repeatedly puns on the word “current,” referring both to the flow of a river and the Present Moment in the flow of time. 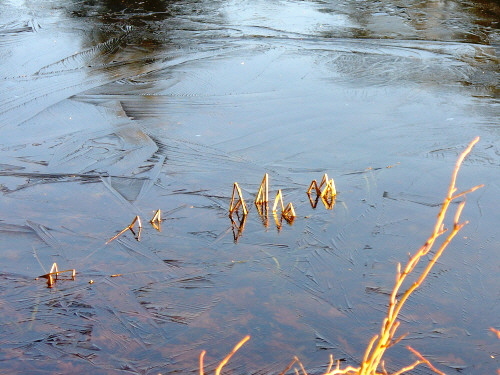 Time can’t be frozen, but water can, and the Current of Time can be freeze-framed through a camera’s transparent lens. 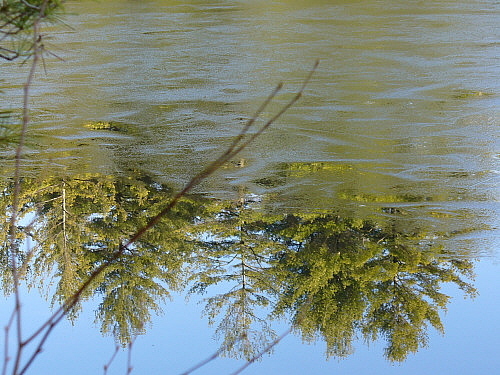 I shot the photo at the top of today’s post in August of 2007, while walking (and wading with) Reggie at Goose Pond in Keene, and the rest of today’s images come from December of 2006, when my fascination with the surface tension, reflections, and textures of freezing water influenced several blog posts. I can’t fish December, 2006 or August, 2007 from the depths of time, but I can rely upon these photos and blog posts to remind me of what was Current then. The images I sketched resonate with what was going on in my life at the time, and they provide a surface through with I can see, via the eye of memory, the depths which lay beneath. In December of 2006, I’d just stuck a tentative toe into the waters of online dating, and I was left cold by its superficiality. The image of a religious icon might serve as a window into a deeper, more spiritual realm, but when your own self is reduced to a clickable thumbnail displayed alongside other lonely-hearts, it’s hard to believe anyone will see through the skin-thin veil of appearance to perceive the depths of personality lurking below. I first clicked on J in January, 2007, and what attracted my scanning eye wasn’t his photo but the wry humor of his profile itself: in a sea of online romantics all claiming to enjoy sunset walks along the beach, J’s profile was the only one that made me laugh by making fun of the absurdity of so many people all trying to stand out by sounding exactly the same. When I emailed J to tell him I was grateful for a spot of humor to enliven an otherwise demoralizing activity, I wasn’t intending to flirt; having already given up hope that online dating could ever work for me, all I wanted was to share a laugh with another drowning soul. That first email was a great way, I realize now, of breaking the ice: instead of starting with the usual online pick-up lines and virtual winks, J’s and my relationship began with a shared laugh. Ultimately–countless emails and three years of laughter later–it didn’t much matter what either of us looked like in our clickable profile-pictures: what made our relationship click was a quirky sense of humor that continues to the present. J made me laugh when I first met him in January, 2007, and he still makes me laugh now. 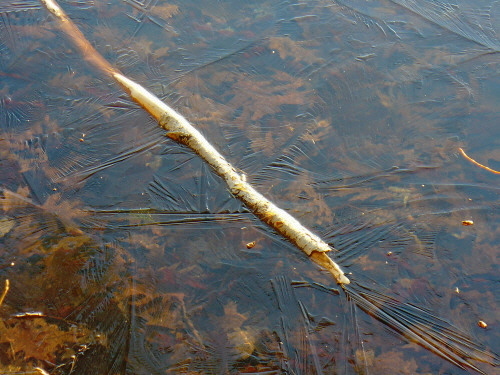 Under the surface of a frigid February, I can look through the water of time to see a pattern that is still current. This is my contribution to yesterday’s Photo Friday theme, Surfaces. You can click here to see my photo-set of “Frozen reflections,” shot at Goose Pond in December, 2006. Now that it’s already August and the dog days of summer are here, I took Reggie for a walk and swim at Goose Pond on Tuesday afternoon after I’d taught my morning summer school class. This is the last week of the summer term at Keene State, which means in a few weeks my students and I will be headed back to school for the fall term. 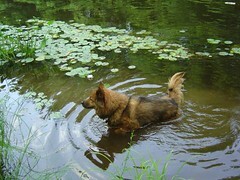 These days, time seems as slippery and elusive as a wet dog. If you don’t believe me when I say it’s only a few weeks until fall, don’t take my word for it. 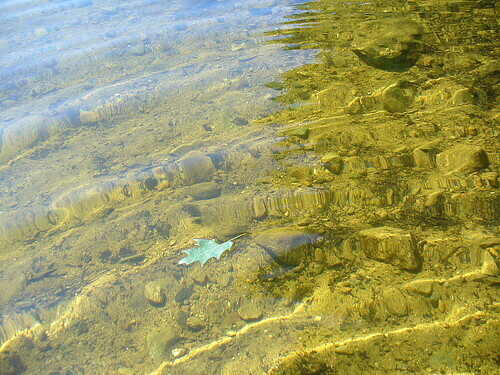 Listen instead to the mute testimony of the season’s first changed and fallen leaf. 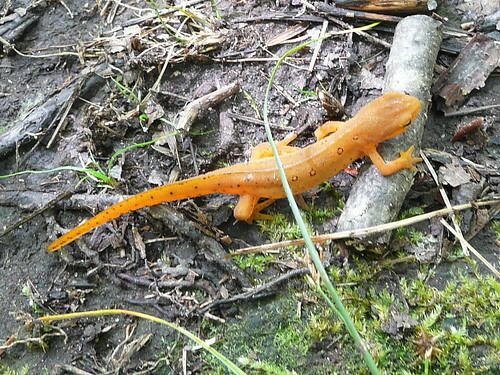 Click here for a brief photo-set from Tuesday’s hike at Goose Pond. Enjoy! On hot summer days, I get almost as much satisfaction watching Reggie wade at Goose Pond as I get illicitly swimming there myself. This summer I haven’t been walking Reggie as much at Goose Pond as I normally do, and I myself haven’t been swimming there at all. In June, I spent too much time away from Keene–first in Provincetown, next in Spartanburg, and then in Atlanta–to spend much time cooling my heels, and in July I was too busy teaching summer school and being geographically bipolar. On Tuesday, Reggie and I went walking at Goose Pond for the first time in nearly a month, and it felt a bit like coming home to a place you’d almost, sadly, forgotten about. 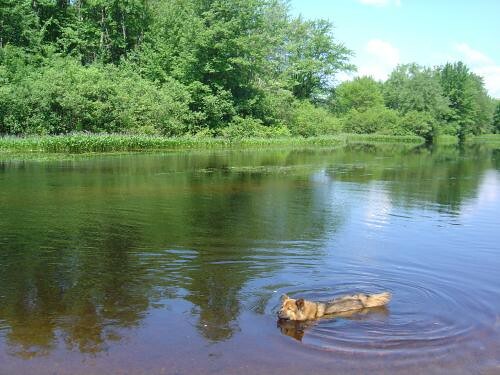 Every time I go to Goose Pond in the summertime, I find it incredibly calming to watch the dog go wading. 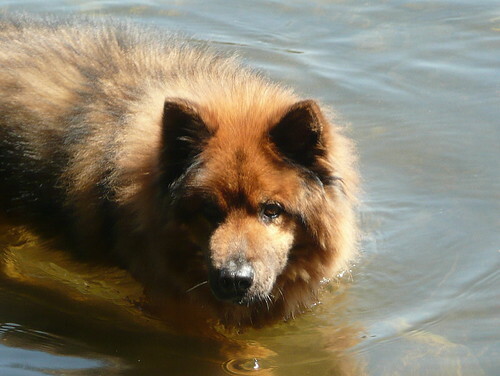 Even if I don’t get my feet wet, it is soothing to imagine the kiss of water on hot skin underneath a thick, perpetually shedding fur coat. After wading, Reggie comes home to leave dark, doggy-shaped wet spots on the hardwood floor: the smudge-print of a happy, chilled out dog. 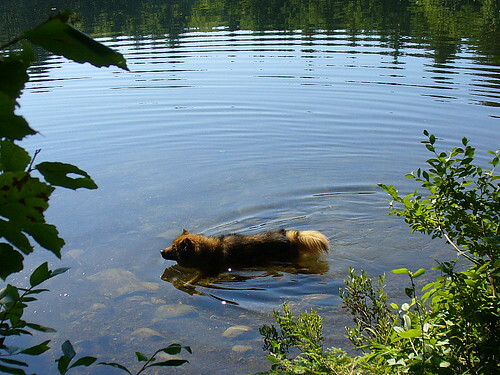 Although doggy wet-spots don’t make for Good Housekeeping, it makes me feel good to imagine Reggie sleeping off a long hike, lots of deep-woods sniffing, and the blissful sensation of cool water. What’s good for the dog, I like to think, is good for my dog-loving soul. On Tuesday, I forgot to wear a swimsuit under my clothes, and Goose Pond is too popular with dog-walkers, hikers, and other swimmers for me to consider skinny-dipping. So taking a cue from Reggie, all I did on Tuesday was go wading, rolling the bottoms on my capri pants so I could walk up to my knees in cool, clear water that sparkled with reflections of the midday sun. 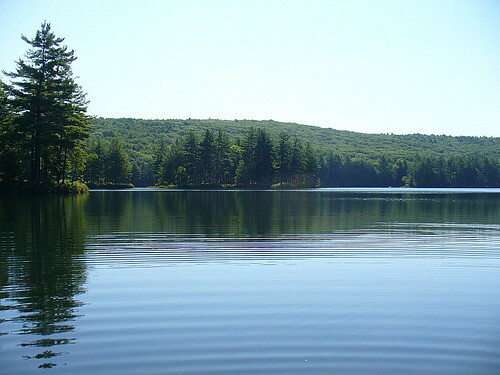 On a week when Leslee was disappointed to find Walden Pond closed to swimmers because of elevated bacteria levels, Goose Pond was quiet and pristine, the only ripples emanating from my quiet shore being the ones stirred by my own toes. 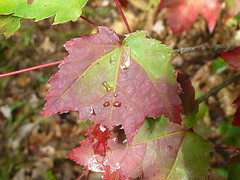 This is my contribution for today’s Photo Friday theme, Wet. 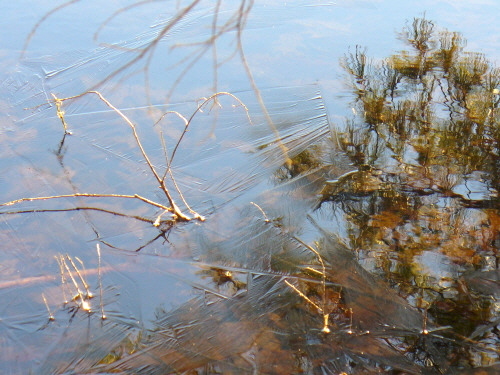 I’m still oddly fascinated with images of the thin skin of ice that’s been forming on Goose Pond, the crystal interstices between solid and liquid mesmerizing me with their jagged and jutting lines. How is it, I wonder, that something fluid and flowing suddenly, upon reaching a certain magical temperature, transforms into something entirely different, the brittle fragility of ice belying water’s amorphous liquidity? 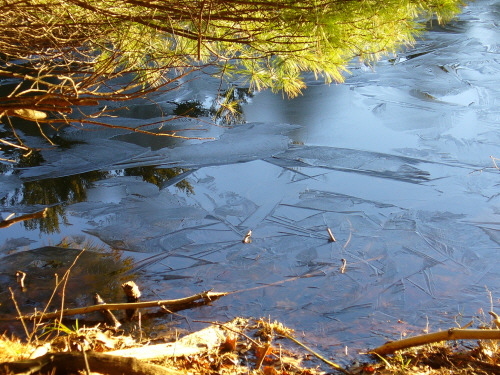 The crystal patterns of freezing water look like scarring skin, and the thin solid film on Goose Pond is a skin, a delicate membrane containing the parameters of something vast, murky, and deep. Never having sounded Goose Pond, I don’t know precisely how deep it is, but having swum there, I know the point at which its bottom drops from beneath my treading toes and the temperature of its water suddenly goes from sun-warmed to bone-chillingly cold. 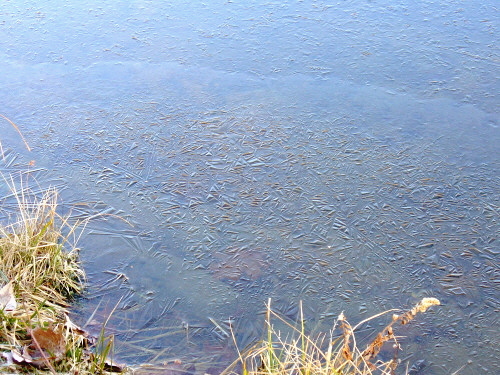 Like a mute creature, Goose Pond keeps its innards hidden; now in winter it grows a hide that is streaked with striations, long crystal lines knitting a tough integument against intrusion. We humans are also vast, deep, and murky creatures, our infinite psyches being mostly unplumbed and our daily interactions merely skating the surface of consciousness. 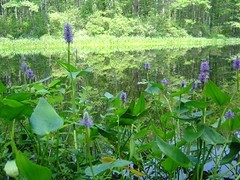 How much deeper than any pond do our spirits surge? At what point do our psychic depths drop beneath our treading toes, chilling us with the unfathomable? Today on New Year’s Eve, we skate another sort of interstice, the intricate edge of Now and Then. We say a leopard can’t change its spots, but our penchant for New Year’s resolutions suggests we see ourselves as aquatic, able to morph from liquid to solid then perhaps even to pure air: sublime. On the surface, both consciousness and time are textured, alluring onlookers with the illusory promise of solidity. Do you dare skate the membraneous film between Now and Then, and do you dare pierce the surface to plumb your own hidden depths?